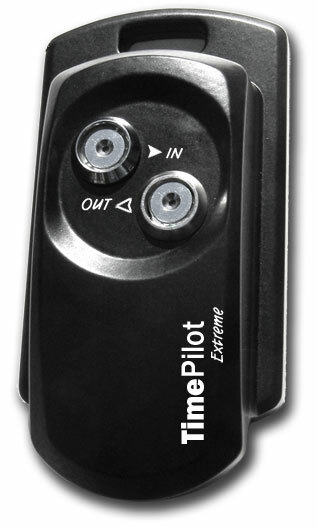 TimePilots new rugged system is designed for outdoor use, although it can be used inside, too. It commonly would be used at construction sites, where the clock is exposed to the elements. The clock is locked down to prevent theft, but can be moved easily to another site when necessary. System exports to many popular payroll systems including: Excel, Paychex, QuickBooks, Peachtree, and ADP. The clock is mounted and locked using the secure mounting plate and padlock. Each employee is issued an iButton and uses it to clock in and out. The clock's memory holds all clock-in and clock-out data. When the supervisor wants to collect the data, he unlocks the padlock, inserts the included USB drive into the bottom of the clock and taps a special Management iButton to one of the iButton probes. The clock then recognizes the supervisor and downloads its data to the drive. The data is protected from unauthorized access, because the clock won't download data unless you tap the Management iButton to it. The supervisor repeats this process with any other Extreme timeclocks he owns. The supervisor then plugs the USB drive into the computer running the TimePilot Extreme software. The software will import the data into the TimePilot database or e-mail it to another location for payroll processing. Extreme Data Manager: Supervisors use this password-protected module to manage the data collected from the Extreme timeclocks. This module is used to download the time and attendance data from the USB drive either directly into the TimePilot database so the data can be processed using TimePilot Central (see below) or be emailed the data to another computer for processing. TimePilot Central: This password-protected module is used by supervisors to add and delete employees from the system, view and correct employee clock-ins and clock-outs and prepare the data for payroll. In it they can modify the data, generate reports and export the data in a format that can be read by a spreadsheet program like Microsoft Excel or by many of the leading payroll services and software packages. TimePilot Extreme also can be combined with TimePilot PC and TimePilot Vetro to create a single time and attendance system that fits your business's needs perfectly. All TimePilot time and attendance systems use the same management software; once you know one system, you know them all. Time clock with protected mounting plate and screws. Metal mounting plate fixes the time clock to wall; latch for padlock keeps it there. Up to 2,000 employees, 12,000 transactions per clock, multiple clocks per system. Audible and visual signal when employees clock in and out. Each clock holds 12,000 clock-ins and clock-outs. The time-tested TimePilot software can handle multiple clocks and up to 2,000 employees. Windows 7, Vista, XP (with Service Pack 2), 2000, NT 4.0.